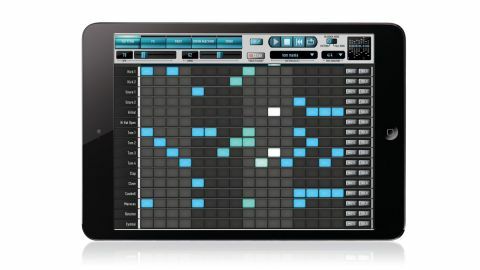 An iPad drum machine for loose change? As a highly creative, easy-to-use and great-sounding addition to your iPad music studio, Diode-108 is pretty much essential. More edit options would be nice. This 16-voice iPad drum machine is fuelled by an excellent and sizeable library of classic beatbox samples and original sounds by Dubsounds,Samples From Mars, 99Sounds and Orange Tree Samples, with all the essential compatibilities in place: Inter-App Audio, AudioBus, Dropbox, microphone and Core MIDI. Load a preset kit or combine sounds from the library and your own collection to make a new one, then program or tap in as many 16-step patterns as you like and string them together into a song. The 16-channel mixer-style Drum Machine editor lets you adjust the amount or mix of Distortion, Compression and Reverb effects, and tweak Volume, Pan, Gate time and Pitch. Diode-108's big feature, though, is the implementation of per-step effects. Each channel includes its own series of step sequencers for modulating the above controls throughout the pattern, plus EQ (Tone) and the wet/dry Delay mix. Editing is done in basic Slider Mode (set a discrete value per step) or the cleverly designed Advanced Mode, which interpolates between steps in various ways. Multitouch is supported for quickly creating ramps and curves, and switching the Pitch sequencer to Note Mode enables absolute chromatic pitching of the sound for melodic parts, with the note name listed at the top of each step. The Special FX sequencer, meanwhile, presents a rack of 15 creative effect 'blocks' (Reverse, Bitcrush Sweep, Dive, Flanger, etc) that can be dragged onto the steps of the sequence and stretched across multiple steps. It all hangs together very well, giving the user extensive control over both patterns and sounds. The problem is, while the effects sound OK, there's very little on offer in the way of editable parameters for each one. The delay, for example, has just delay time, feedback and filter controls, and they're all quite restrictive in their ranges, while the compressor can't be adjusted at all. The Special FX blocks, too, have no controls - you have to take them as they come. However, given the price tag, we really are nitpicking!